Google Sheets integration allows you to send responses in real-time to a specified Sheet of your choice. With the integration enabled you can organise and analyse results the way you desire. Easily access & share your survey real-time data. 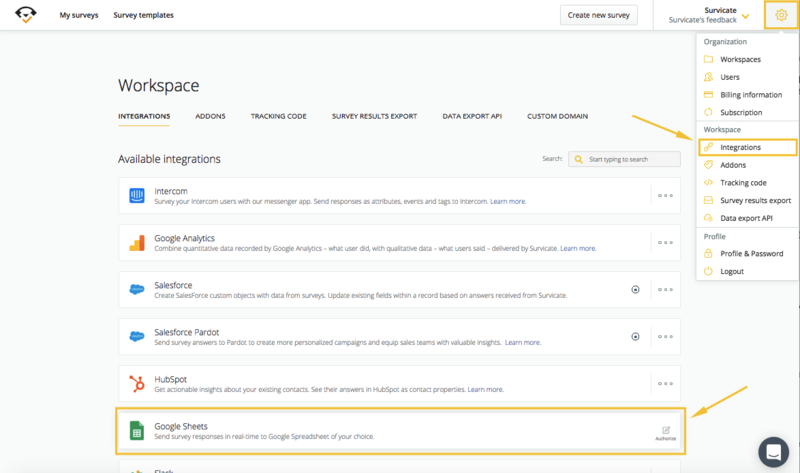 To send responses to Google Sheets go to the ⚙️Settings tab of your survey and open Google Sheets Integration menu. There you can choose Spreadsheet and Sheet to feed with data. ❗️ Also please make sure that the account you have integrated has the ownership of the spreadsheet you'd like to choose.